"I told you we shouldn't have rented the room to a Hen party"
"Oh no, we've had poachers!" "What's this! I asked for an eggshell finish." Ethel, do you think this chicken house is rather too hot? "I often wish that I was a fry on the wall." Gromit kept ducking as Wallace's new Fried-Egg-o-Matic gathered speed. An eggcellent eggsample of eggcentricity in art. Surely in contention for The Turnover Prize...? "When it comes to cooking she hasn't a bloody clue, last night she attempted doing a stir-fry"
I think the guy in the flat below is a Juggler. Surveyor:- I’ve checked for damp and you have nothing to worry about. Your walls and floor are crisp and dry. I really don’t get it, he devours all the other’s in Starmix. 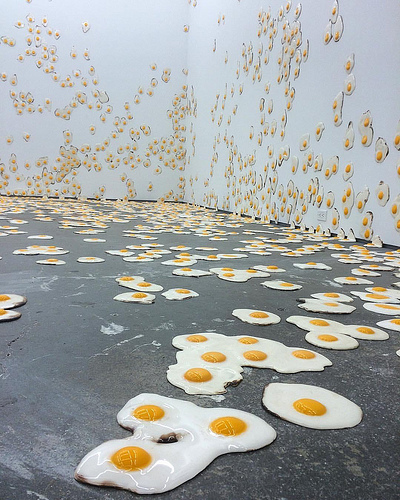 I don't like the new eggsentric interior designer. "I told you that such a miserable pay rise offer would upset the breakfast chef." Shouldn't have hired that interior eggorater. After 425 days in solitary confinement they discovered Rodney didn't like eggs. Help yourself. The bacon's next door. Toast is second on the left. KFC's new pressure cooker had unexpected results. Have you seen the new eggshibition yet? "I'd heard that flocked wallpaper was making a comeback." "Darling, I think the chickens are seriously unwell, they clearly have dreadful diarrhoea and they must be running a very high temperature"